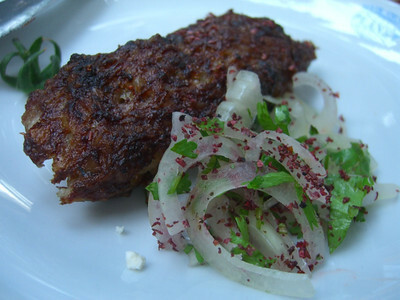 Onions, herbs and sumak complement grilled ground meat at a 7-course shashlik (barbecue) dinner in Baku. 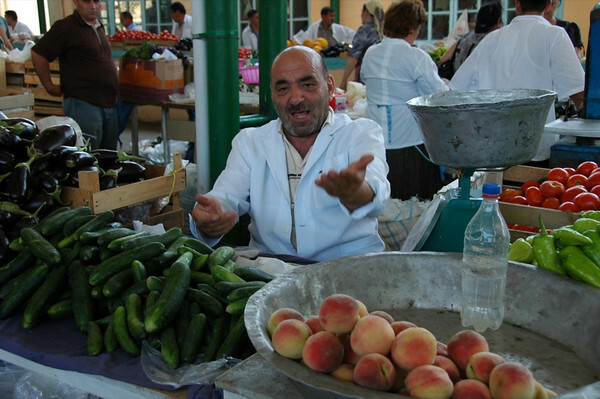 Read about Azerbaijani food and the rest of our visit to Azerbaijan. 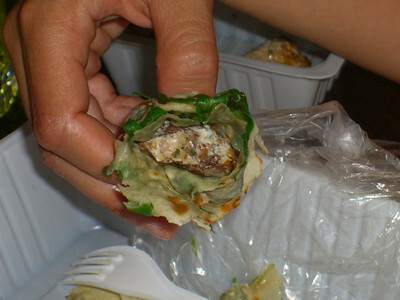 A goyarti kutabi (pancake filled with greens) wraps around badrijan (eggplant) salad. Our own delicious concoction from the rather vast offering of Chudo Pechka...We became regulars at Chudo Pechka where we could get all varieties of kutabi and pastries for a few fractions of a manat. 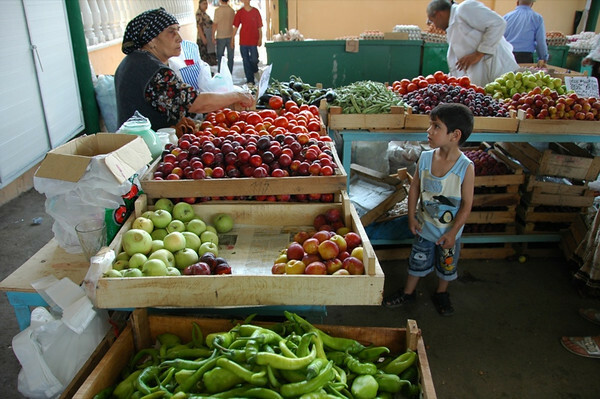 Read about Azerbaijani food and the rest of our visit to Azerbaijan. 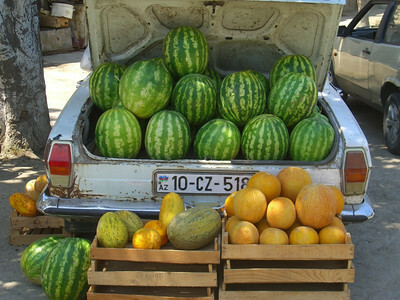 Sweet melons for sale at Baku's Taza Bazaar. 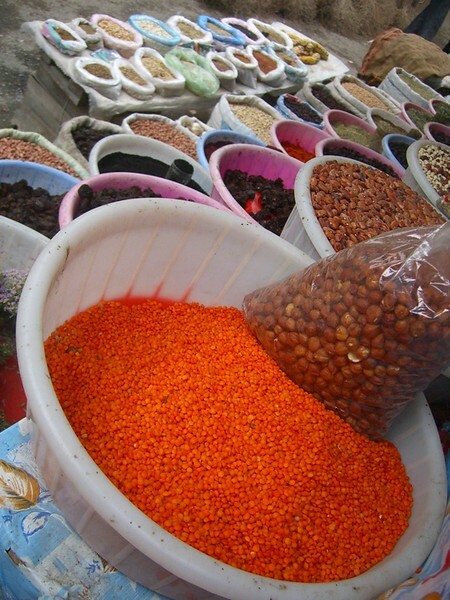 Read about Azerbaijani food and the rest of our visit to Azerbaijan. Stuffed with ground lamb and topped with sour yogurt, these manti were delicious. Our friend told us that manti is difficult to find in Baku, so we were fortunate to discover these. 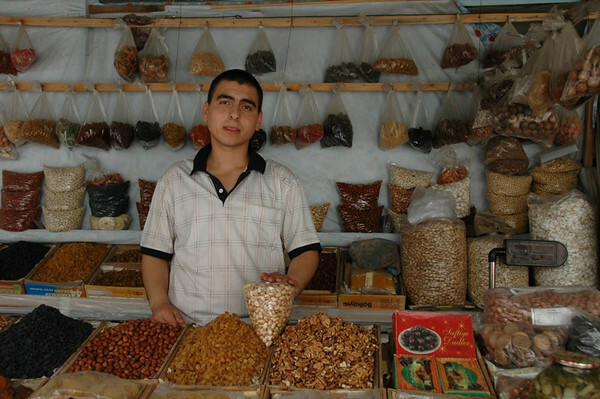 Read about Azerbaijani food and the rest of our visit to Azerbaijan. 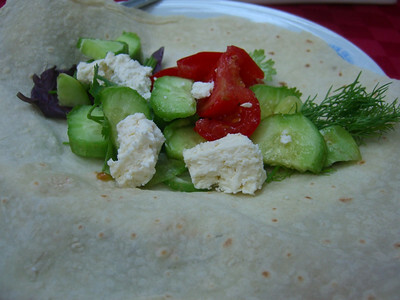 Fresh vegetables, herbs and cheese make for a tasty and healthy wrap in Baku. 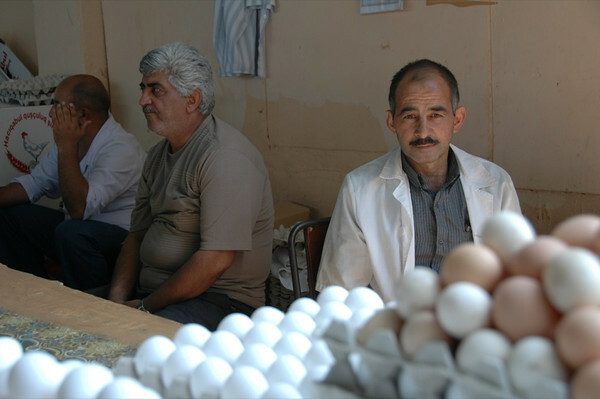 Read about Azerbaijani food and the rest of our visit to Azerbaijan. If you buy caviar at the Taza Bazaar, it feels like you are doing something illegal...which you kind of are. 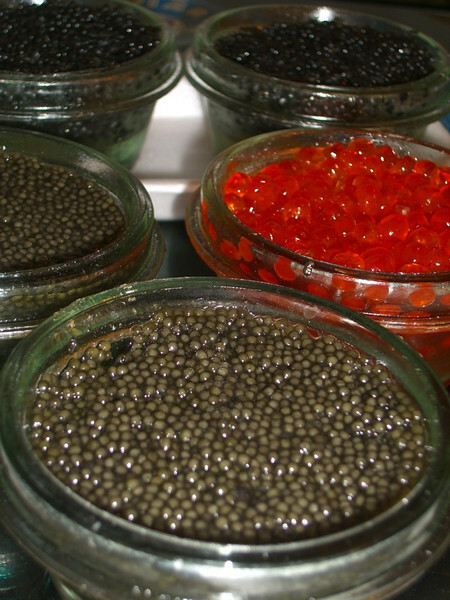 The government controls the caviar business, but crafty entrepreneurs manage to get their hands on some anyway. They sidle up to tourists upon their entry into the market, whispering "caviar" under their breath. Then you are taken to a small room with a refrigerator for tasting and buying...Our favorite was the Beluga caviar - smooth and not too salty. At $50 per jar, it's spendy, but a bargain if compared to prices abroad. Read about Azerbaijani food and the rest of our visit to Azerbaijan. 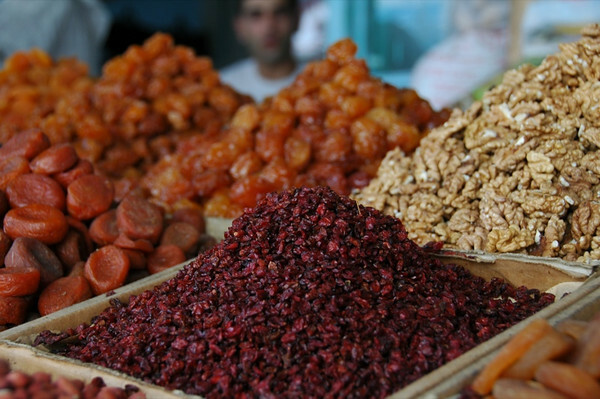 An old woman sorts grape leaves aside a dried fruit and nut stand at Baku's Taza Bazaar. 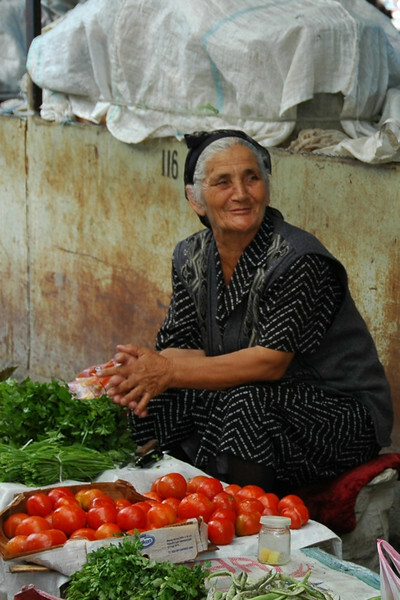 Read about Azerbaijani food and the rest of our visit to Azerbaijan. Taza Bazaar, Baku. Read about Azerbaijani food and the rest of our visit to Azerbaijan. 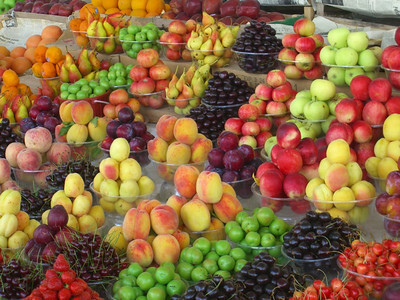 Piles of sweet fruit on offer at Baku's Taza Bazaar. Read about Azerbaijani food and the rest of our visit to Azerbaijan. After Audrey took a picture of this expressive vendor at Taza Bazaar, he pulled out his mobile phone and took a photo of Audrey. Read about Azerbaijani food and the rest of our visit to Azerbaijan. Taza Bazaar - Baku. Read about Azerbaijani food and the rest of our visit to Azerbaijan. 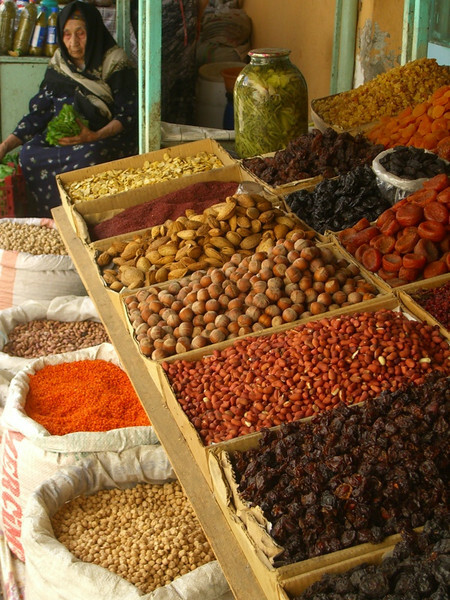 Dried pomegranate seeds are a good complement for meat and fish. Taza Bazaar, Baku. Read about Azerbaijani food and the rest of our visit to Azerbaijan. 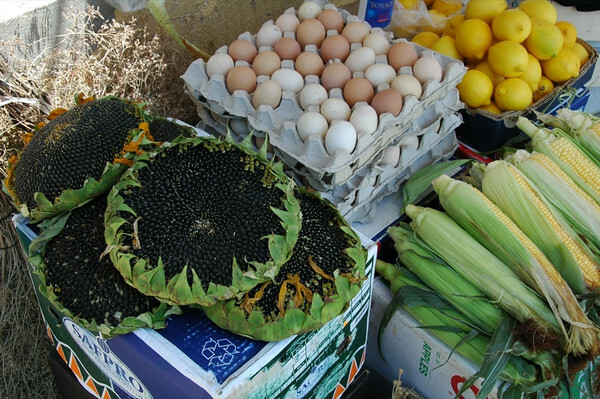 Lots of healthy tastes at this stand in the Taza Bazaar in Shaki. Read about Azerbaijani food and the rest of our visit to Azerbaijan. This watermelon vendor takes an afternoon smoke break to talk with us upon our exit from Taza Bazaar. Read about Azerbaijani food and the rest of our visit to Azerbaijan. This woman from Shaki's market asked Audrey whether her teeth were real...Later, we learned that Shaki's water is lacking iodine, leaving the locals with chronic dental problems...and rows of gold teeth. Read about Azerbaijani food and the rest of our visit to Azerbaijan. 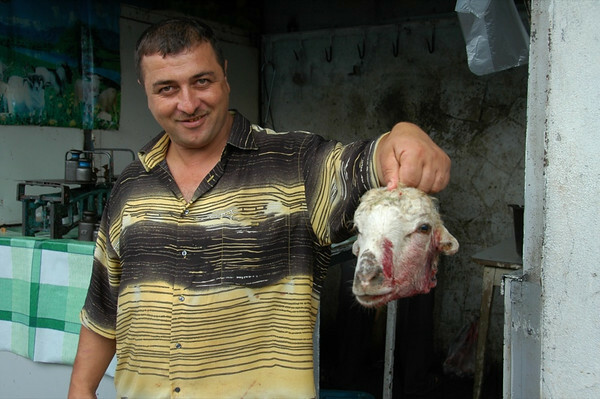 This vendor at Shaki's Taza Bazaar was more than happy to show off a few of his fresh goat heads. Read about Azerbaijani food and the rest of our visit to Azerbaijan. 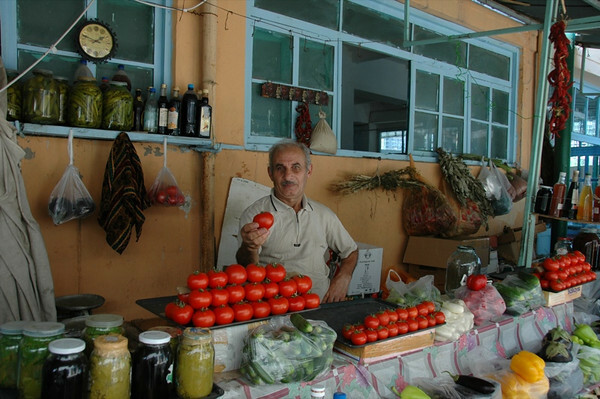 Tomatoes and herbs on sale at Shaki's food market. 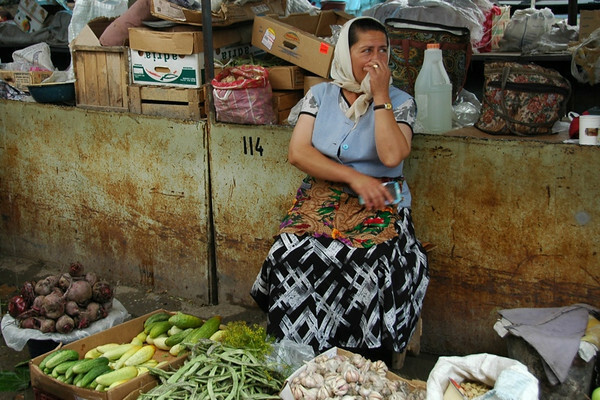 Read about Azerbaijani food and the rest of our visit to Azerbaijan.